Back from a refreshing trip to Europe, free-spirited Alexa returns to college to pursue a dream career. While reluctant to blend academic demands with emotional attachments at first, she befriends Zeke who fascinates her with his wits and poise.Disciplined and conscientious, her world is shaken to the core when an abrupt change in his behaviour unfolds a chameleonic Zeke who spirals her mind into a haze of turbulence. As she reconstructs her sanity, along comes Vinson who charms her into the perfect romance. But when he suddenly disappears, she begins to search for answers unaware that someones hidden agenda is manipulating her obsession with finding the truth to the verge of madness. 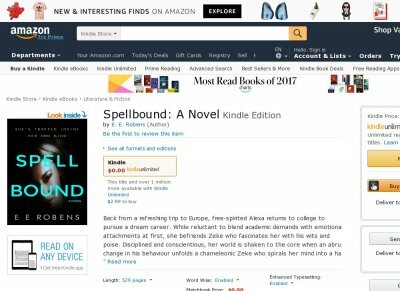 Spellbound is a tale of the young and troubled at heart, toxic relationships and bittersweet memoirs.